The cascading roof terraces of New Providence Wharf provide a spectacular view across London and the Thames. 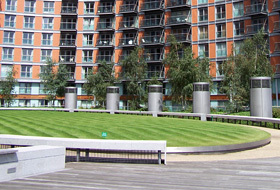 The podium over the underground garage is designed as a park and is a courtyard accessible to the public. To the eye, the oval lawn at the centre of the courtyard provides an oasis of tranquillity. The towering ventilation shafts are the only reminder that there is an underground garage beneath the lush green lawn. On the balconies, you feel as if you are standing on a jetty thanks to the water channel that runs right up to the building facade. The grating between the green roof and the water channel is used for ventilating the underground garage. 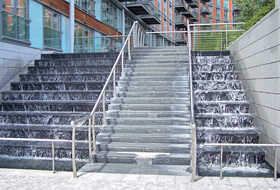 The water cascades down the steps like a waterfall – attracting attention. 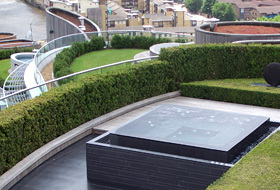 There are water features everywhere – here, a modern fountain on one of the roof terraces. New Providence Wharf in London boldly stands out with its cascading roof terraces that provide the occupants with green space and a stunning panoramic view of the Thames. This unique design is achieved through the elliptic building rising like steps of stairs from one end to the other, from the 12th to the 19th storey. The entire building project is characterised by oval shapes. For example, an oval lawn creates a peaceful oasis at the centre of the large courtyard, which is on the podium over the underground garage. 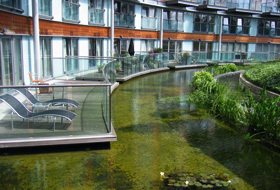 In Great Britain, local and national planning policy also promotes the use of green roofs. 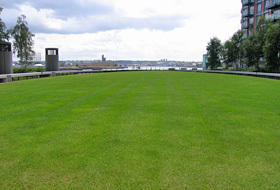 According to the planning authorities, as the environmental and economic benefits of green roofs have long been acknowledged, particularly in high density towns and cities, all large projects such as those in Greater London now have to include a green roofing element. 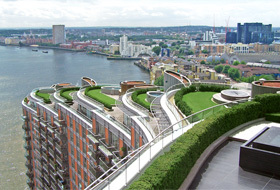 Renowned London architects Skidmore, Owings & Merrill designed the residential project New Providence Wharf to include intensive green roofs on all roof areas – an incredible 3,000 m² – both on the terraced areas at high altitude and on the podium roof of the underground garage. The green roof concept runs through the entire complex that covers an area of 8.3 hectares and was built in four phases by the developers Ballymore Group, beginning in 2001. In addition to the residential building, New Providence Wharf, the development includes the Ontario Tower with its 29 storeys, the Radisson Hotel and the Michigan building. It brings together apartments, offices, retail units, restaurants and numerous leisure opportunities – all under green roofs. The New Providence Wharf site was a wasteland on the Thames in the Docklands area of East London. The area was formerly known as Charrington Wharf and was originally an oil depot. Once the area was no longer used as a depot, a wasteland with spontaneous vegetation developed, also known in Great Britain as a “brownfield” site. With that, it became a welcome home for many species of bird such as the Black Redstart. Once the entire area was developed, this bird found a new home on the roofs, primarily on the extensive green roofs. These roofs provide an environment for the birds similar to that of the wasteland. 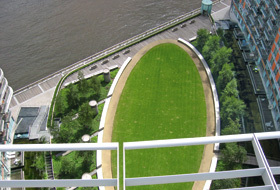 In addition to other buildings, therefore, New Providence Wharf was also given at least one extensive green area: pre-cultivated sedum mats were installed on the uppermost roof area at an altitude of about 58 metres and inaccessible to the occupants. That’s nature conservation! A permanently reliable greening solution was required for the intensive green roofing planned for the cascading roof terraces and the podium: the ZinCo system build up with Floradrain® FD 40-E offered the best solution here. Building projects dimensioned similar to New Providence Wharf are nothing unusual for the experienced green roof manufacturer. All materials were supplied by Alumasc Exteriors Building Products Ltd., the ZinCo partner company in Great Britain. The contractors Riggs Roofing and Cladding from Stratford/London were responsible for the expert installation of the green roofing. The roof waterproofing membrane consists of a 6 mm-thick liquid waterproofing layer made of a mixture of bitumen and synthetic rubber. It was applied as a hot liquid and a polyester sheet was then applied on site. An additional root-resistant layer was installed on this waterproof membrane followed by an insulation layer of extruded polystyrene rigid foam boards. The green roof system was then added to this inverted roof. First, the filter sheet SF was installed and on top of this the drainage and water retention elements Floradrain® FD 40-E – the heart of the system build up. These 40 mm deep elements store rainwater in the cells on their upperside and quickly drain off excess water through the system of channels on their underside. A second filter sheet SF is then applied to separate the drainage layer from the subsequent substrate layer and ensure permanent reliability and performance. 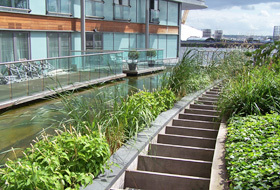 The ZinCo system substrate “Roof garden” was used here, adapted to suit the intensive green roof required. The substrate depth varies from approx. 20 cm beneath the lawn areas to approx. 65 cm in areas where trees are planted. This system build-up provides exactly the right foundation for carrying out any and all design wishes on the roof areas. The podium over the underground garage is a courtyard that is accessible to the public. The large oval lawn picks up the elliptic concept of the overall building and creates a haven of tranquillity, a pathway with a continuous bench running along its perimeter. Beyond that again are trees that stretch right up to a wide water channel running directly along the front of the building. The balconies of the ground floor apartments, therefore, protrude out over the water like a jetty. Clear shapes also dictate the design of the roof terraces, which is almost the same on each storey. Hedges of evergreen perennials create a wind break and enclose the lawn that has a small swimming pool at its centre. New Providence Wharf with its cascading design lends a futuristic touch to the London skyline, providing much living space and at the same time green space. A large-scale complex has been created on this site that will provide a model for other large urban centres thanks to its usable green roof space.